If you're a business, college or charitable organization looking for a fun way to brand merchandise, consider engravable key chains. 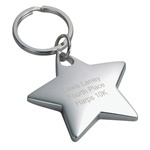 Engraved key rings also make wonderful personalized gifts for birthdays, graduations and other special events. We have a variety of styles to choose from in star, oval, heart and square. 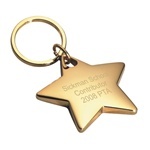 Our selection of personalized key rings includes our bestselling gold or silver star personalized key rings, which make outstanding rewards for employees and team members. Each key chain is gift boxed with a silver or gold bow. You can choose from a variety of fonts for your message, which is engraved into the surface with a diamond tip. We are able to engrave both sides of a key chain. There are no minimums for our custom engraved keychains, and engraving is included in the price of the keychain. Don't forget to take advantage of free shipping on orders of $99 or more! LOVE-ly. The Nickel Heart has shiny nickel shell with a matte silver-tone center. Consider engraved initial. For weddings, lovers, friends, awards. Entire item is 2-1/2" long. Gift boxed. Beautiful and Substantial. Nickel-Plated Teardrop Key Ring has matte-finish engraved center and shiny nickel outer shell. Engraves well. Great gifts for awards, groomsmen and bridal attendants, family, employees awards and recognition. ITEM # TPPK16 Mirror-finish Nickel-Plated Silver Oval Key Ring. Great for longer engraved inscriptions. Gifts for new home owners, new drivers, employees' recognition and awards, school volunteers. Thick. Overall 3-3/4"" long. Gift boxed. Satin-finish Solid Brass Oval Key Ring. Perfect gift for anyone who appreciates classic quality. This custom brass key tag is a best seller for innkeepers, new homeowners, company logos. 2-1/2 inches by 1-3/8 inches. Gift boxed. The Square is polished nickel and the center is hard nickel with brushed-finish. Subtle Engraving. GREAT gift for Graduate, Groomsmen, Birthday, Student Awards, Team Members. Gift Boxed. The rectangle is polished nickel and the engraved center is brushed black with silver engraving. GREAT gift for Graduate, Groomsmen, Birthday, Student Awards, Team Members. Gift Boxed.